Recipes — The Amos Book Co.
Love of dogs is central to the Amos Book Co. We love furry friends so much, in fact, that we've scoured the web looking for the tastiest, all-natural treat recipes that you'll feel great about feeding your pup. We test all our recipes to ensure that they are #AmosApproved before posting them here each Tuesday. Here you can find all of our #TreatYourselfTuesday recipes referenced on the Facebook page. Whether your pet is big and tall, skinny or small, we've got the recipe for you. This week, we used our classic biscuit dough recipe to whip up some puppy love! Let your pooch know just how loved he or she is with this classic recipe! Preheat oven to 400 degrees. Combine flour and cream of wheat in a large bowl. Place canola oil in another large bowl. Add flour mixture to the oil slowly, mixing with stock until combined. Knead the dough on a lightly floured surface before rolling out to ¼ inch thickness. Cut with your favorite cookie cutters and transfer to a lined cookie sheet. Bake for 20 minutes. Let cool and scarf up! These biscuits are adapted from Martha Stewart's Paw Print Treats and are #AmosApproved ! 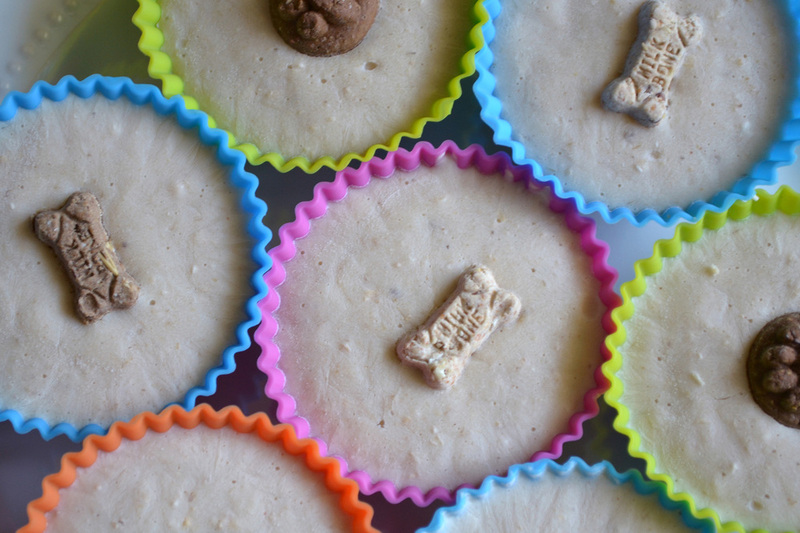 These freezer treats are perfect for dogs who need to shed a few pounds. Use fresh or frozen broccoli and a few ingredients you likely have on hand to make these tasty treats! As always, these treats are #AmosApproved! Blend all ingredients together. Pour mixture into an ice cube tray and freeze overnight. Remove from tray and enjoy! Mix coconut oil, peanut butter, and oats by hand or with a food processor. If you are mixing by hand, you will likely need to add a few tablespoons of whole wheat flour to hold the mixture together. Scoop teaspoon sized amount of mixture into palms and roll into a ball. 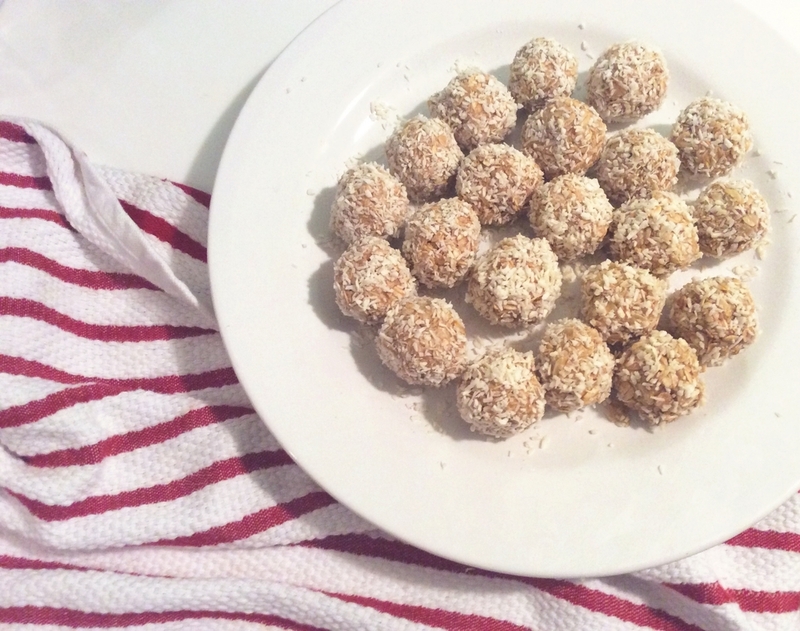 Roll each ball in finely shredded coconut until covered. Refrigerate for 30 minutes to allow snowballs to firm up. Enjoy! This recipe is adapted from prettyfluffy.com. As always, these treats are ‪#‎AmosApproved‬! It's a #TreatYourselfTuesday Birthday Bonanza!! This week we're baking up a Birthday Cupcake for all our furry friends! This all natural PupCake is so delicious (and nutritious) even humans will want a few bites! Preheat oven to 350 degrees and grease a 9 inch round cake pan. Combine the egg, peanut butter, applesauce, and vanilla in a large bowl. Mix well. Squeeze excess moisture out of the shredded zucchini and carrot before adding the veggies in to the mixture. Sift together the flour and baking soda and add in, stirring gradually. Spread batter evenly in the cake pan. Bake 25-30 minutes. Enjoy! For all those pups who can't believe it's only Tuesday...It's time to ‪#‎TreatYourself‬ ! This week we've whipped up Strawberry Banana Drop Biscuits. So good the humans might snag a few too! Preheat oven to 350 degrees. Mash the banana and stir in diced strawberries. Mix in flour, oatmeal, and yogurt. Drop tablespoon-sized biscuits onto a lined cookie sheet. Bake 20-25 minutes. Enjoy! As always, this ‪#‎TreatYourselfTuesday‬ recipe is ‪#‎AmosApproved‬! With a few baking ingredients that you probably have on hand, you can treat your pup to some Cut Out Biscuits! This dough works beautifully with biscuit and cookie cutters, making it a go-to recipe for holidays! These spooky cookies are absolutely ‪#‎AmosApproved‬! Preheat oven to 400 degrees. Combine flour and cream of wheat in a large bowl. Place canola oil in another large bowl. Add flour mixture to the oil slowly, mixing with chicken stock until combined. Knead the dough on a lightly floured surface before rolling out to ¼ inch thickness. Cut with your favorite cookie cutters and transfer to a lined cookie sheet. Bake for 20 minutes. This week's ‪#‎TreatYourselfTuesday‬ uses leftover fruit and basic pantry items! Pups are sure to love these Mixed Fruit Doggie Scones. As always, these treats are ‪#‎AmosApproved‬ ! Mash banana and add in diced fruit. Mix in oatmeal, whole wheat, and yogurt. Roll out dough on a well-floured surface until about ¼ inch thick. Cut with cookie or biscuit cutter. Bake at 350 degrees for 18-20 minutes. Gobble up! Calling all pampered puppy owners! Today's ‪#‎TreatYourselfTuesday‬ calls for five ingredients and a whole lotta love. Impress your friends (both canine and human) with these Puppy Pretzels! Preheat the oven to 350 degrees. Beat the egg and set aside 1 tablespoon of the egg in a separate bowl. Combine applesauce, whole wheat flour, oats and cheese with what remains of the beaten egg. Take 2 tablespoons of the dough and roll into a long tube, about 8-10 inches. Fold into a pretzel shape. Brush the tops of the pretzels with the remaining tablespoon of egg. Bake for approximately 25-30 minutes or until the tops are slightly browned. In a rush? This recipe also works as a simple drop biscuit! Do you have a senior dog? Today's ‪#‎TreatYourselfTuesday‬ recipe is the one for you! 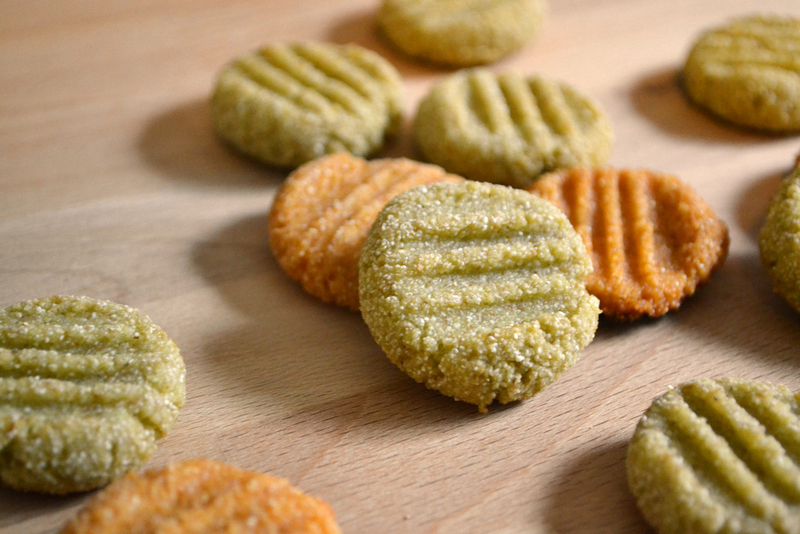 These Easy Chew Treats are made with only three ingredients! These treats are great for older dogs who require a softer treat. 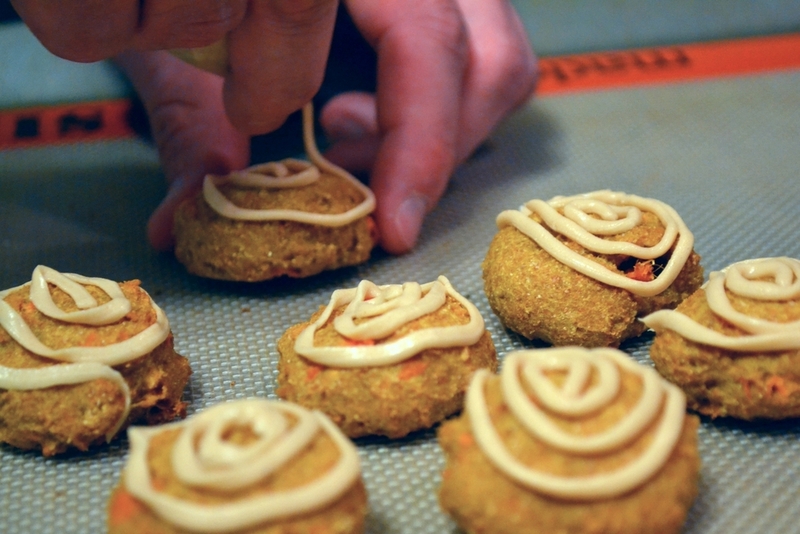 We used Gerber’s carrot and pea baby food, but you can choose any flavor your pooch might like. Just be sure to read the ingredients and always avoid onion, garlic, and grapes! Preheat oven to 350 degrees. Mix all ingredients together and let sit for 5 minutes to thicken. Roll into small balls and press with a wet fork to flatten into cookies. Bake for 15 minutes. Adapted from Sheknows.com’s Easy to Chew Doggie Snacks. Mash sweet potato with fork or potato masher. Mix the sweet potato together with eggs, flour, and applesauce to make biscuit dough. Roll the dough into balls and form into small cookies on a greased or lined cookie sheet. Bake at 350 degrees for 35-45 minutes. If desired, frost with “icing” made with the greek yogurt and peanut butter. This recipe is ‪#‎AmosApproved‬ ! This week the Amos Book Co. is whipping up some low-fat treats to get you ready for the fall. Whisk together flour and baking powder, removing any lumps. Add remaining ingredients and stir until combined. Roll the dough onto a lightly floured surface and cut with a biscuit or cookie cutter. Arrange on a parchment-lined baking sheet. Bake approximately 30 minutes, or until crisp. Let cool and gobble up! This recipe was adapted from fakeginger.com's pumpkin apple dog treats. It is ‪#‎AmosApproved‬! This week we are kicking off ‪#‎TreatYourselfTuesday‬ with Amos! These all natural frosty treats are a breeze to whip up and are ‪#‎AmosApproved‬! Toss all ingredients in a blender and blend until smooth. Divide evenly into muffin cups or an ice cube tray. We like to use silicon muffin liners because the frosty treats pop right out! Optional: top with a small treat. Freeze overnight.